What began with a beautiful look back in An Adventure in Time and Space continued with a tale of the most epic of proportions, in the “The Day of the Doctor.” A story centuries in the making, combining the powers of the Hero, the Warrior and the Doctor to tell the greatest story never known, providing a superb conclusion to a Doctor Who milestone that couldn’t have been more perfect. In 'The Day of the Doctor,' written by Steven Moffat, the fan-favorite storyteller masterfully weaves a complicated - and likely controversial - adventure through the heart of the Time Lord’s darkest moment, bringing together all of the forms of television’s iconic time traveler to provide an unnecessary update to what was thought to be the demise of Gallifrey, and the Doctor’s most defining decision. Unnecessary, yes – but worth it? Absolutely. The demise of Gallifrey - which has since been revealed to be anything but - is the end result of this anniversary special; however, this is not not its greatest accomplishment. Instead, it’s Moffat’s confidence in his ability as a storyteller which stands out and makes this complex adventure work, as his attention to detail and passion for the franchise shines throughout, wholeheartedly earning its use of such weighty elements from the series’ fast and ever-growing mythology. With Moffat’s carefully crafted words at disposal, Matt Smith, David Tennant and John Hurt each shine as their own, defined versions of the Doctor, while also tagging enough of the others’ sentences with quirky remarks to remind those watching that, although different, these men are one and the same – different versions with different experiences to add, or forget, as with the case of Matt Smith’s Doctor. An explanation for the personality of Tennant’s Doctor, too, was surprisingly included, and is a perfect example of how the immense attention to details justifies everything needed to tell this impossible tale. Tennant’s Doctor – the man who regrets – and Smith’s Doctor – the man who forgets – help provide a wonderful bookend to the evolution of a character so defined by a single decision from his past. This allows audiences to believe, albeit momentarily, that the two actors’ unique cadence wasn’t simply birthed in an audition room, but that it was a calculated move to convey the stages of the Doctor as he attempts to cope with the self-inflicted genocide of his entire race. 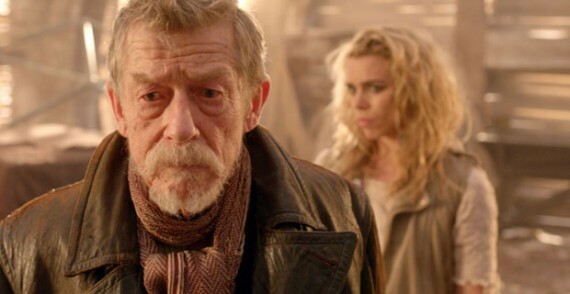 Surprises in the storytelling are not the only thing, however; the 50th Anniversary also includes more than enough onscreen surprises which raise the same goose bumps, including, but not limited to: Billie Piper’s Secret Diary of a Call Girl-fueled version of Bad Wolf Rose Tyler and Tom Baker’s magical appearance as the Curator - who also happened to leave Smith’s Doctor with some curious clues about possible returning faces. As with anything, questions must be asked, and the Doctor Who 50th Anniversary is no different: “Is it worth it?” is likely most common and, perhaps, most important. “The Day of the Doctor” adds a surprisingly happy twist to the Doctor’s darkest moment, and Moffat’s use of a clever time travel twist, to keep the integrity of the former Doctors intact, does little to change the fact that Smith’s Doctor now knows the truth – and for what purpose? Two Better questions may be: If not Moffat, then who? If not now, then when? If the modern world of film and television has taught us anything, it’s that the medium deems a franchise is only as important as the money it makes. If it doesn't make money, it goes away, only to return in another form - perhaps then led by someone who might care about the franchise, but who doesn't have the ability to project such passions onscreen. Good intentions only go so far in storytelling, and a poor tale told to such a dedicated following is not easily forgotten. So why not Steven Moffat? If the man who created the terrifying Jekyll because of his love of 'The Strange Case of Dr. Jekyll and Mr. Hyde' - who created the imaginative Sherlock (with An Adventure in Space and Time writer Mark Gatiss) because of his love of Sir Arthur Conan Doyle's iconic detective tales - who, in 2006, wrote a short story for a Doctor Who magazine which he then turned into the fan-favorite episode “Blink” – wants to take on a Time War tale which he, himself, said was too impossible of a feat, why not let him? Why, indeed. Perhaps the answer to all this, after seeing 'The Day of the Doctor,' is: because he can, completely and passionately. Doctor Who returns in December for the Doctor Who Christmas Special - Matt Smith’s final appearance as the Doctor.